This interior studio comes with two double beds, full bath, a wet bar and a private balcony overlooking the interior courtyard. The wet bar area includes a sink, cabinet space, a microwave and a mini fridge! 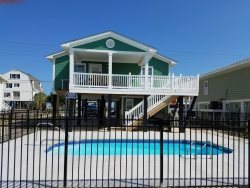 Located at the Landmark resort which is in close proximity to Myrtle Beach's most loved attractions, including Family Kingdom (.8 mi), The Boardwalk & Promenade (1 mi), Broadway at the Beach (4 mi) and only 2 miles from the Airport! The Landmark is known for it's many pool amenity options (see below)!